An Indonesia visa and passport valid for at least 6 months are required for all citizens of the United States who wish to enter the country. Indonesia has several different visa categories each with its own requirements and fees. The Visa-on-Arrival or VOA can be obtained in limited circumstances at several airports and a few seaports. Visas-on-Arrival are only issued for private, temporary business or pleasure visits. Those traveling for other purposes must obtain the appropriate Indonesian visa before arrival. The most frequently requested visa to Indonesia is the visitor visa. This type of visa is issued for the purposes of tourism, business, social or cultural exchange, journalism and reasearch. While a single or multiple-entry visa can be issued for the first three purposes of travel, only single entry visas are issued for journalism or research. You can either apply for a visa to Indonesia yourself or you can contract a private travel document expediter. If you prefer quick, guaranteed service, you can click on the link to apply online for your Indonesia visa. Travelers who enter Indonesia through Bali must have two fully blank passport pages in their passports. Those entering the country through other ports of entry you must have at least one blank page. If your passport is nearly full, be sure to obtain extra blank passport pages before you travel - go to How to Add Extra Pages to Your U.S. Passport. According to the Indonesia Embassy in the U.S., most regions and cities in Indonesia are very safe for US citizens to travel. However, with respect to certain domestic conditions and for their own safety, you are advised to contact the Indonesian Embassy or Consulate Generals or through the travel agency on the situation and information of the region that would be visited in Indonesia. Three regions in Indonesia that you cannot visit without special permission and approval are Aceh, Maluku, and Irian Jaya. If you plan to enter one of these restricted regions, you must obtain special authorization from Indonesian authorities. The following items are required for all visas to Indonesia. Specific requirements for a tourist of business visa can be found below. 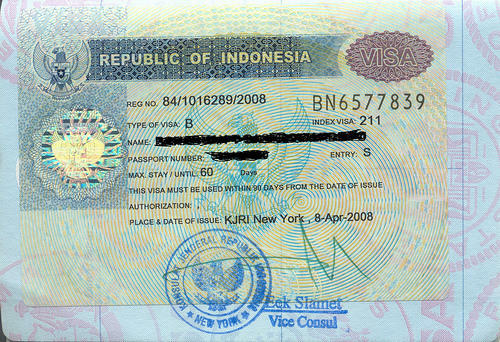 Indonesia travel visas are affixed in your passport on a blank visa page. The Indonesia Embassy and consulates will not stamp a visa on an amended page. There is only one Indonesia visa application form for every type of travel visa. The Visa Application is in .pdf format. You will need the free Adobe Acrobat Reader to open and print the document. You probably have it on your computer but if you don't, you can get it here. A tourist visa is required to enter Indonesia. Besides the general requirements, you will also need to provide the following items. Itinerary (original/copy) or a letter from travel agents, airline, steamship company, confirming the purchase of tickets into Indonesia (Note the officer may ask the copy of the original airplane ticket). Letter of Employment, indicating the employment status of the applicant. For retiree, please submit proof of the retirement fund. Copy of bank statement, indicating the current applicant's fund at least two weeks prior to the date of obtaining visa. For Non-US Citizen: Please provide Copy of US Permanent Residence/Visa/Valid I-20 from schools/universities. Please be advised that applicant with a B1/B2 visa would not be processed unless there is firm ground for the application. Such applicant would be suggested to obtain Indonesian visa from country of origin/country of residency. Tourist Visa is only for Single Entry. The Tourist Visa holder could not enter the restricted regions (Aceh, Maluku and Irian Jaya). Indonesia Tourist Visa - Apply Online Today! Heading to Indonesia for business? Besides the general requirements listed above, you will also need the following items. A letter of intent (in duplicate) from employer or sponsor, which describes the purpose of the visit and guaranteeing all transportation and living expenses that will incur in Indonesia. For multiple entries visa includes a letter of invitation (in duplicate) from business partner or sponsor in Indonesia, which describes the purpose of visit. The applicant who wishes to enter the restricted regions (Aceh, Maluku, Irian Jaya) must obtain special authorization from Indonesian authorities. Please advised the Embassy/Consulate Generals about the intention to visit the restricted regions. This rule also applies to those who previously work at the regions and hold immigration permission, e.g. Freeport employees. The applicant could also contact the employer/company/sponsor in Indonesia to obtain such permission through the Clearing House at the Department of Foreign Affairs (DEPLU). Please contact the Directorate for Consular Affairs at the Department. The Indonesian Embassy/Consulate Generals would not issue the visa without official notification of approval from the Indonesian authority to enter such regions. If you're a non-US citizen, includes either: copy of US Permanent Residence/Visa/Valid I-20 from schools/universities. Please be advised that applicant with a B1/B2 visa would not be processed unless there is firm ground for the application. Such applicant would be suggested to obtain Indonesian visa from country of origin/country of residency. Indonesia Business Visa - Apply Online Today! If you don't live in or near any of the cities where the Indonesia Consulate Generals are located, you might want to contract a travel visa expediting service. They will verify your visa application before it is ever sent, thereby avoiding unnecessary delays or rejections. They will also personally walk your application through each step guaranteeing timely and efficient processing of your Indonesia visa.